Uplift Seat Assist makes any armchair an automatic lifting seat. 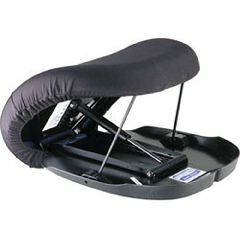 The Uplift Seat Assist is a self-powered lifting cushion assists you gently up and down from an armchair or sofa. As you sit down in a seat, you are gently eased into a seated position. The lifting piston activates automatically as you shift forward and begin to stand, providing a stable lift up from the chair or sofa. The Uplift Seat Assist is portable with built-in carrying handles. Coated memory foam cushion adjusts to the users weight, shape and temperature. Waterproof, fire retardant cover of the UpLift Seat Assist is removable and machine washable. Weight: 9 lbs. Black. Comfort while seated. Solid Construction. My mother was having difficulty lifting herself out of her power chair. The Uplift Seat Assist provides just enough help to overcome the inertia and get her going in the right direction. Our concern had been that it might not be comfortable sitting on it for hours at a time, as she spends most of the day in her chair. She reports, though, that it's as comfortable as the cushion it replaced. Hard to Control. Lever disengages. Uncomfortable. Even when the lever is properly set to a person's weight, if the seat is soft, the uplift will disengage and not rise. So this device is helpful only when sitting on a hard surface. The Seat Assist is also uncomfortable after only about 15 minutes. Hard to Control. Unstable. Uncomfortable. Limited Functions. i bought the 1000 model that has memory foam. its next to useless. i tried it with many seniors and have yet to find a person that likes it. its just too hard to sit on longer than 5 min. even with a pillow added its too hard. pillows add instability. this product needs to be perfected a lot. How can I get a replacement plastic pan for the Uplift Easy/Up seats? The metal springs break the plastic pans.. I need your telephone number to give to a 90 yr. old man who does not have on-line access and does his own ordering! Asked on Jul 15, 2011 6:40:09 PM by jan from Evaston, IL. Is there a retail outlet in Edmonton?